According to Wikipedia, in 1876 a five-day-long fire destroyed thirty acres of the Cape May town center. 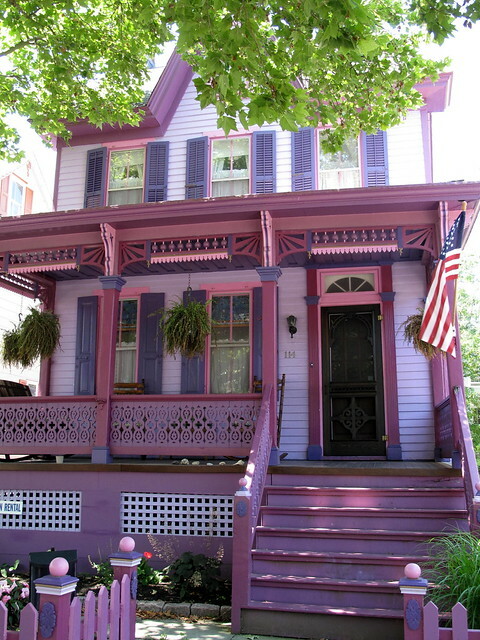 Replacement homes were almost uniformly of Victorian style. 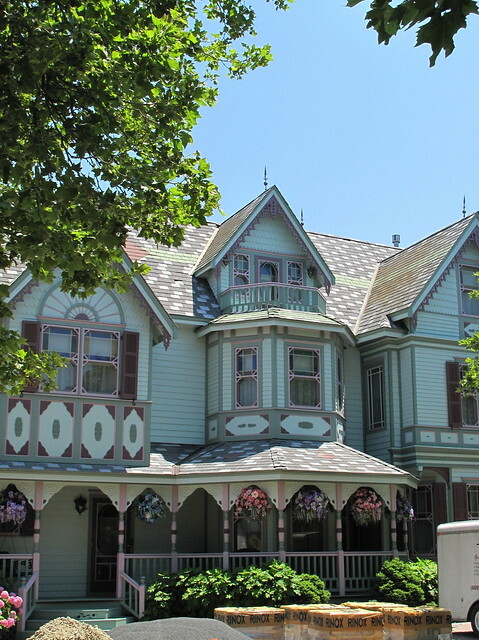 As a result of this and of more recent preservation efforts, Cape May is noted for its large number of well-maintained Victorian houses, the second largest collection of such homes in the nation after San Francisco. 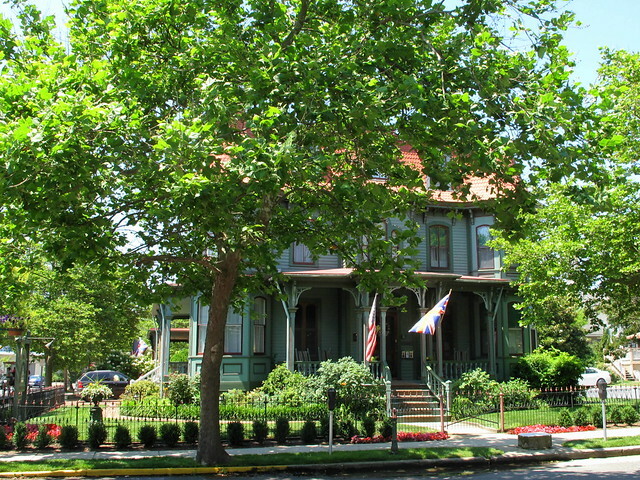 In 1976, the entire city of Cape May was officially designated a National Historic Landmark. It is the only city in the United States wholly designated as such. 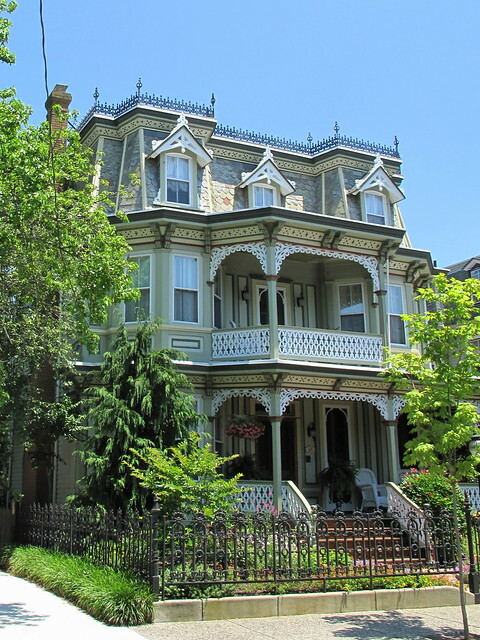 Many of these beautiful old Victorians have been converted into bed and breakfasts, but some are still private homes. The details are incredible, aren’t they? I love the color combinations too. Gingerbread (the kind we eat) became available in the 1700’s. Supposedly, the most popular form was a Christmas cookie decorated and hung in windows during the Christmas season. 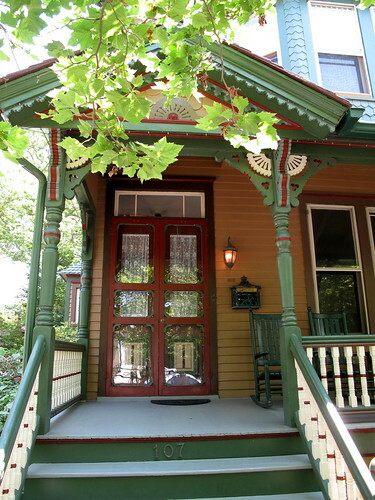 The style of architectural decoration known as “gingerbread” wasn’t established until the steam-powered scroll saw and lathe became available in the middle 1800’s. It’s been over 20 years since I was last in Cape May, so I don’t remember the trees being so overgrown. That presented a bit of a challenge for photography, so I had to settle for details in some cases…. 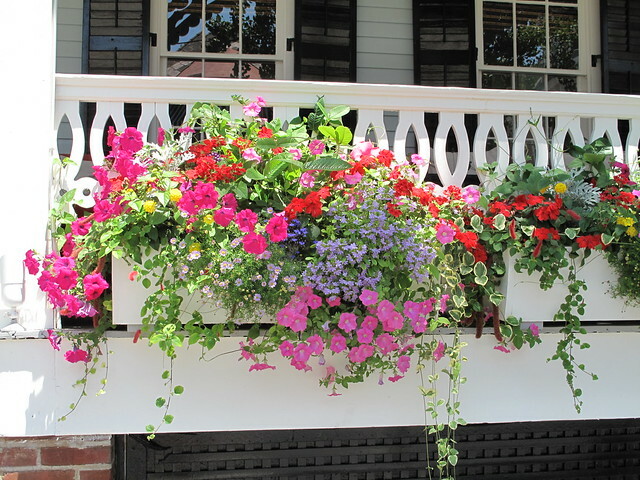 The flowers in Cape May are amazing. 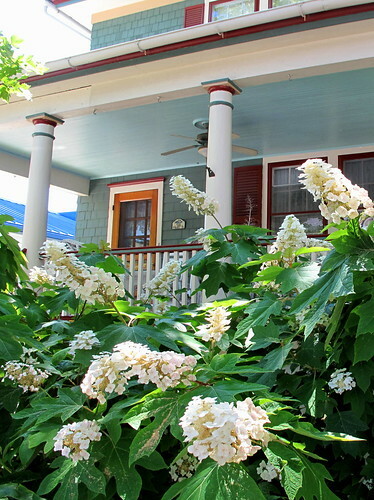 If only I could get my oakleaf hydrangeas to look like this! Can you imagine walking up to this every day? Not sure if I could take this color on a regular basis, but it’s pretty striking. 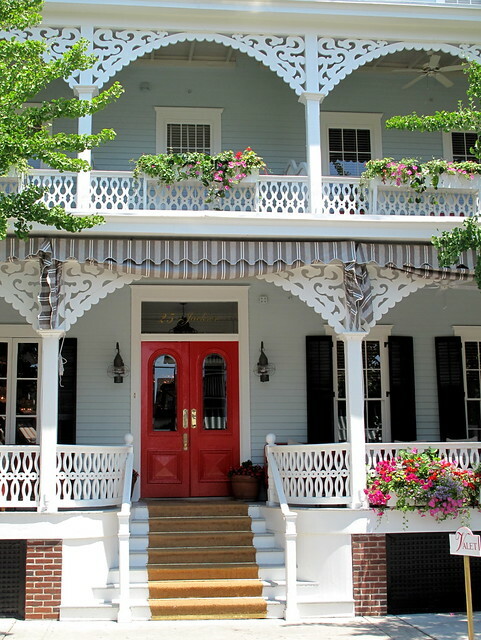 This entry was posted in photography, Travel and tagged Cape May, flowerboxes, New Jersey, oakleaf hydrangeas, Victorian-era architecture. Bookmark the permalink. Tres magnifique! Bravo!! What incredible homes!!! What stunning photography!!!! Thanks so much, Bonnie. Hope you are doing well. Thank you so much, Ms Pearl. These photos are like gifts. The one with those two purple chairs… So, so beautiful. 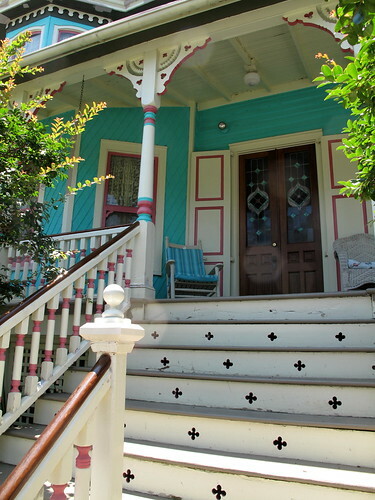 It is lovely how well kept they are, nice fresh looking paint, so well assorted colors. You’re so welcome! They really are beautifully maintained. Only a couple needed paint and they were in the process of being restored. I spent my wedding night in Cape May! Then we returned for our 15th anniversary. 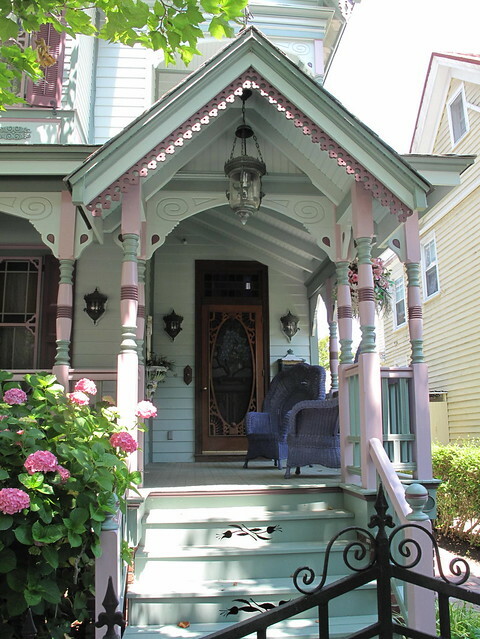 The houses are gorgeous – it’s a great family-oriented shore town. The zoo is amazing! Lucky you! The whole time we were there, I was thinking it would make a wonderful place to honeymoon. Yes, definitely great for families. These homes are stunning. They almost look like dolls’ houses. 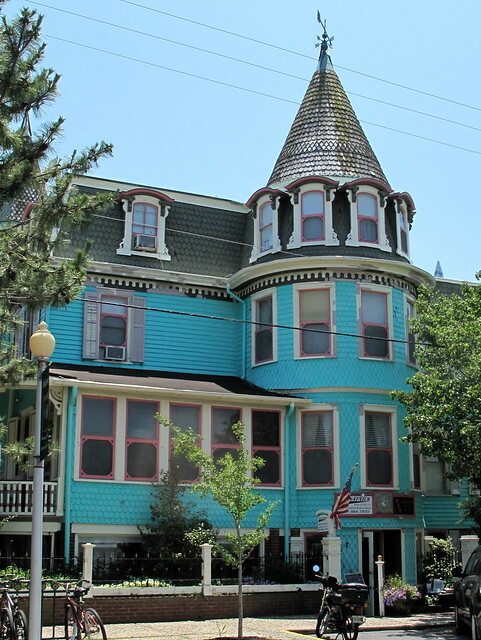 I didn’t know that the entire town of Cape May was on the National Register. It makes me want to take a trip there. Definitely worth a trip, Jacquelin! If you want to stay in one of the bed and breakfasts, reserve early. Everything we saw had no vacancy.